This is very interesting lateral thinking exercise in which series of conversation between few people leads to logical deductions. In this lateral thinking puzzle your challenge is to find logically the date of birth of one person. Read full conversation between these people carefully to solve this interesting riddle! Can you solve this lateral thinking riddle? Answer of this "Lateral Thinking Exercise", can be viewed by clicking on answer button. Please do give your best try before looking at the answer. When Rajesh says that "I don't know Ashu's date of birth. However I know that Evanthe also does not know it." This statement means that Rajesh is knowing the month which contains the numbers which are repeated in other months i.e. Rajesh contains the month which does not have any unique number as date. It means that Rajesh is not having months Feb and April as these months contains dates Feb 19 and April 21 which are unique. and she says "I was not knowing it however now I know Ashu's birthday." 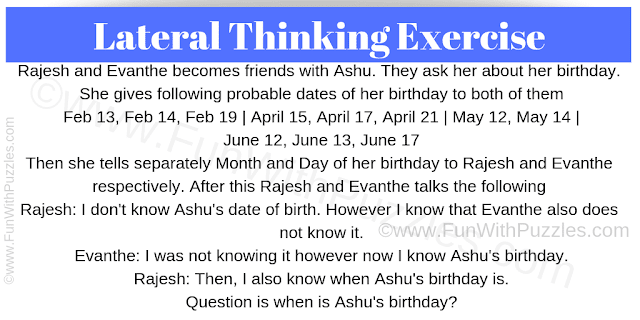 After listening to Evanthe, Rajesh looks at the month he is having and says that "Then, I also know when Ashu's birthday is." It means that he is having the month which has now only one date left i.e. May 14, otherwise he cannot make the above statement. So the answer is May 14. Eye Test-What Number do you See?